welcomed the group to the rapid-fire presentations. CPMH researchers from the University of Cape Town and Stellenbosch University came together in November to share their ongoing research projects. The goal of the rapid-fire presentations was to inform the greater research community of CPMH activities. After being welcomed by Ashraf Kagee and Katherine Sorsdahl, CPMH co-director, Dr Sarah Skeen presented their work at the Institute for Life Course Health Research. After that Stephan Rabie described the work he and his colleagues have done through the Eyethu Soccer Study. Sarah and Stephan do their work through Stellenboch University. The University of Cape Town’s CPMH team then presented their current work. 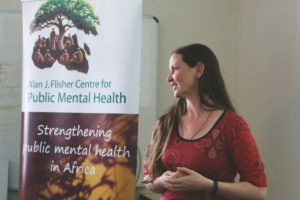 Prof Crick Lund, professor of Global Mental Health, presented on the Project to Improve Mental Health Care (PRIME), an eight-year research consortium. Dr Claire van der Westhuizen followed with a discussion on MIND and MINDY. Dr Simone Honikman spoke about the PHMP’s challenges and successes, Dr Zulfa Abrahams spoke about the first year of ASSET and prof Marguerite Schneider updated the attendees on STRiDE. Following that, three of the CPMH’s PhD students updated us on their research progress.